More than 120 cyclists and walkers joined a friendly protest in Inverness at the weekend. 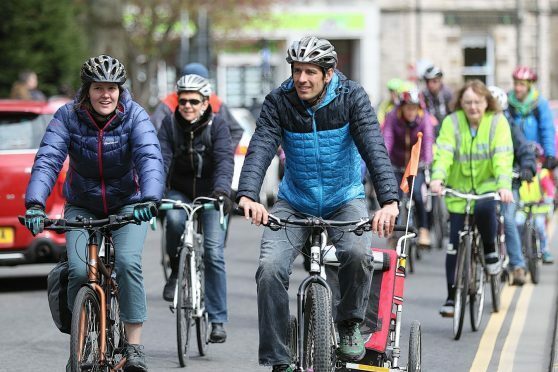 The city’s first Pedal on Parliament (Pop) event, backed by a raft of organisations and individuals, was among several held across Scotland to highlight the importance of cycle ways and pedestrian routes in an age of increasing car use. People of all ages joined the throng, setting off from Bellfield Park and converging on the riverside by Eden Court Theatre. The campaigners added colour and character to the city’s streets taking to a range of motor-free vehicles including tricycles and tandems. Environmental speakers echoed the calls for more action to promote safe cycling. Voicing his support, Highlands and Islands Green MSP John Finnie argued that huge investment in major transport projects, such as the £3billion dualling of the A96 between Inverness and Aberdeen, was missing an important point. Anne Thomas, of campaign organisation Transition Black Isle, warned that climate change was happening now. Event organiser Mark Mr Falconer urged supporters to press home the messages with election candidates. A spokeswoman for Transport Scotland said: “The Scottish Government has put in place record investment in walking and cycling and will continue to do so over the life of this parliament. “In 2017-18, we have committed £39.3million to active travel. Investment in walking and cycling infrastructure, training and road safety projects increased in the last parliamentary session. “Over £1billion a year is being invested in public transport and other sustainable transport options to encourage people out of their cars and onto public transport and active travel modes.